What do you wish school was like? You’re having a serious case of the Mondays. Both of your best friends are out sick, Ms. Miller had a pop quiz, and the cafeteria is serving sloppy joes? Jeeze. You’re walking home from school, and just when you thought this Monday couldn’t get any worse, you kick something and start to stumble, hoping that no one saw you, because that’s the last thing you need today! You look down and you pick up what appears to be a lamp. Like a genie lamp. ‘No way,’ you mutter aloud. You rub it, because hey, it can’t hurt, right? And wouldn’t you know it- a genie pops out. ‘What was in those sloppy joes?’ you begin to wonder. 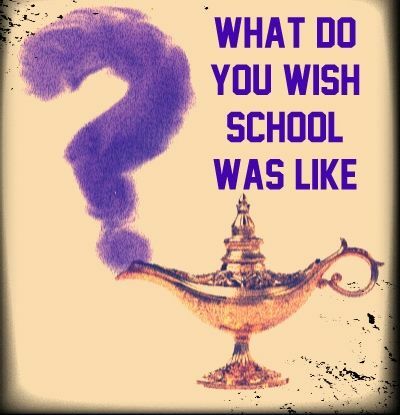 ‘Wishes about my school? How do you mean?’ you reply. If you could design your own school what would it be like? What do you wish your school had more of? Send us an email with your wishes blog post to wishes@gotcorevalues.com letting us know what you’d wish from the genie. One person per month will have their wishes featured on our blog, and be granted cool GotCoreValues stuff. Oh and one more thing…if you’d like us to come to your school and see if we can make your wish a reality, please include that in your email. Happy Wishing! We can’t wait to hear from you!